5 Things You Need to Know About Your Kitchen Exhaust System | Flue Steam Inc.
Knowing these 5 things can help prevent fire and liability issues on your property. The exhaust system is an important part of any commercial kitchen. Far from just a simple venting system, it is actually a vital safety feature. As the owner of a commercial kitchen, you must understand the workings of this system as well as how to maintain it in order to protect your business from the risk of a grease fire. 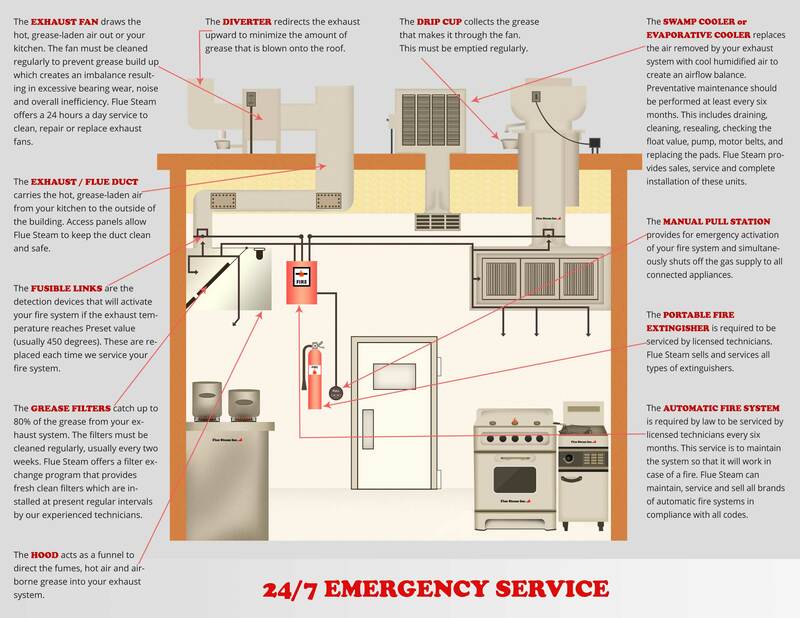 Here are 5 of the most important things you need to know about your kitchen exhaust system. Under the regulations set up by the National Fire Protection Association (NFPA), the owner of the commercial kitchen bears ultimate responsibility for the condition of the exhaust system as well as the necessary fire suppression equipment. You must arrange for inspections, maintenance, and cleanings or else risk being held liable for the damage from any fires that may occur in the kitchen. If you have a property management company handling these tasks for you, you must transfer your responsibilities to them in writing or else risk being held liable for their actions. 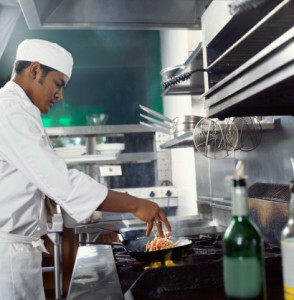 The NFPA has set out some guidelines for when kitchen exhaust systems must be cleaned. Depending on the type and volume of cooking that occurs in your kitchen, you may need to get cleanings every month, every quarter, or once or twice per year. At Flue Steam, we recommend monthly kitchen exhaust hood scraping supplemented by annual or semi annual exhaust system steam cleaning. Ideally, you would get your exhaust ducts cleaned down to the bare metal. If you can’t visually tell if a given exhaust hood or duct section is clean, you can ask an IKECA-certified professional to use a special comb to measure the depth of the grease on the metal and confirm whether or not it meets the standard. NFPA recommendations specify that an access door should be made in the exhaust duct every 12 feet of a horizontal run, every floor of a vertical run, and at every bend in the ductwork. Having these access doors makes it easier to access and thoroughly clean every inch of the exhaust system. If your ductwork does not have sufficient access, Flue Steam can help by installing new access points that meet code requirements. The Fire Marshall is typically the authority in charge of verifying that you have met your obligations as to the cleaning and maintenance of your exhaust system as required by the local fire code. You will need to get certification stickers and inspection reports from the company providing your kitchen exhaust system cleaning as proof that you have complied with your duties.